It’s been a long time coming but, as of March, visitors to Chile – and Chileans themselves - will be able to enjoy cleaner indoor air. 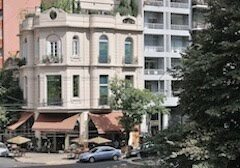 At long, long last, the Chilean Congress has approved a law expanding current tobacco-control legislation to the entirety of restaurants, bars, discos and most other enclosed locations. Tentatively taking effect when the school year begin, it will also restrict tobacco advertising in a country that, unfortunately, suffers one of the highest levels of nicotine addiction in the Americas. At present, the law only requires restaurants to set aside smoke-free areas if they serve customers under age 18, which has meant in practice that many restaurants have caved into the smokers’ lobby – tobacco companies’ influence over legislation has been notorious – and simply refused to accommodate families and, by extension, non-smokers. Under the new legislation, they will have not have that option; apparently, the only area open to smokers will be sidewalk seating and perhaps patios and terraces. That’s still not ideal – the air indoors will be cleaner than outdoors – but it’s a big improvement. Sitting indoors, I will now take a chance on some restaurants that I would not even have considered before. 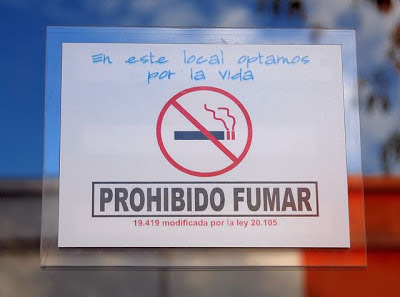 One strength of the Chilean law is that it will prevail nation-wide, unlike in Argentina, where tobacco-producing provinces such as Salta need not conform to the norms of Buenos Aires, where tobacco control has been surprisingly effective. Given that Argentines are, often, greater scofflaws than Chileans, it’s been a revelation to see how effective the legislation there has been. Now if they could only get smokers to stop flicking their butts onto the sidewalk and into the gutter. The new Chilean law appears to have one other major shortcoming: health minister Jaime Mañalich himself has criticized a clause that lets stadium administrators set aside areas for smokers; this could make soccer matches problematical, as their crowds can get rowdy (though not so rowdy as those in Argentina). It also leaves open the question of open-air concerts: in her Santiago appearance last month, Madonna berated smokers in the crowd and walked offstage in protest. In future appearances, the US$150 non-smoking fine could conceivably double the price of their tickets. On New Year’s Eve, a fire destroyed the customs post on the Chilean side of the border at Paso Cardenal Samoré, the second-busiest overland crossing between Chile and Argentina. Incinerating US$700,000 worth of computer equipment in addition to the structure itself, the blaze will close the border until at least January 15. 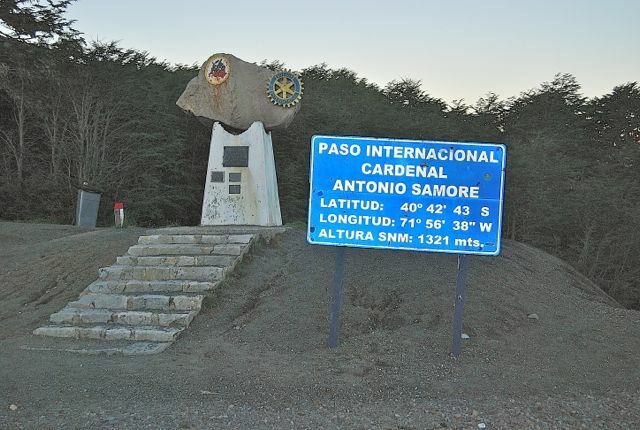 This will require tourists and commercial traffic bound for the Argentine lakes district destinations of Villa la Angostura and San Carlos de Bariloche to make a 550-km detour north to Pucón and over the Mamuil Malal pass. The effect will be roughly comparable to what happened in mid-2011, when the eruption of the Puyehue-Cordón Caulle volcano closed the border for several months, but hopefully this disruption will be shorter. Great news about anti-smoking laws in Chile. This is just a small beginning to educate millions of Chileans. It might take some countries (Chile, China?) another generation to take responsibility for their health. I agree, Roger, this will make Chile an even more pleasant place to travel than it already is. It's also good to hear the closure of the Samoré pass will be so brief.